China is pouring billions of pounds' worth of investment into Greece and other Balkan countries to create a "New Silk Road" from the Mediterranean into the heart of the European Union. The initiative, called One Belt One Road (OBOR) involves the transformation and upgrading of harbours, airports, roads and rail across the Balkans. The Chinese have also bought industries, including a steel factory near the Serbian capital, Belgrade. But there are concerns that the European Union (EU) might eventually object to the level of investment if it poses a significant Chinese threat to European industries. 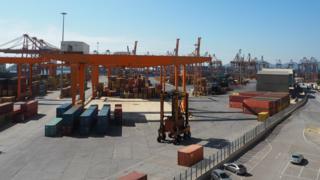 Last year, the Chinese state-owned company Cosco purchased a controlling stake in the port of Piraeus, near Athens. The company is investing 385 million euros (£343m) in Piraeus to maximise both capacity and trade with the EU. Piraeus has always been of immense interest to the Chinese. Its geographical position means it is the first major port for shipments emerging from the Suez Canal into the Mediterranean, and its depth allows it to take the biggest container ships. Nektarios Demenopoulos, a deputy manager of the Port of Piraeus Authority, told the BBC that Chinese investment in Piraeus had expanded significantly since the Chinese took control of the container port in 2009. "In 2016 we handled 3.7 million twenty-foot (6 metre) containers," he explained. "That's double what we handled back in 2009. And we will be expanding the container pier to create a capacity allowing us to handle 7.2 million containers. So we will double through-put again." Can China lead Greece out of darkness? Those Greeks who are working with the Chinese emphasised the important cultural relationship between the two countries. Fotis Provatas, of the Athens-based Greek Chinese Economic Council, said. "I was surprised to see how many people in China know about ancient Greek culture and they respect it very much. And they respect the Western culture because they think - and this is true - that it is a continuation of the ancient Greek culture." He added that the Chinese have huge investment plans for Greece, including plans to buy and then vastly expand Athens airport. He also said China would upgrade the rail network in other Balkan countries, particularly the neighbouring Republic of Macedonia, and Serbia. Mr Provatas welcomed the investment but said there was also a danger of a backlash from the EU. He added: "Europe wants economic cooperation with China but in a different way to us. "We do not have industries so we do not compete with the Chinese in that way. They are welcome to come here and make cars and other industrial products. This is not the same elsewhere in Europe. They are competitors." The Greek government believes Chinese investment will be an important factor in the country's recovery from deep financial crisis. But ministers insist China does not get preferential treatment and that Greece takes its obligations seriously as a member of the EU. Stergios Pitsiarlos, Greece's deputy economics minister, told the BBC, "We think Greece should take advantage of these new opportunities that the Chinese strategy opens up. Our strategy is to take advantage of our geographical position and to attract foreign investment. "It is very clear that the Chinese would like to have a corridor towards Europe and the European market. At this point, the starting point for Greece is that we are a country that is a member of both the European Union and of the eurozone, and we will always respect European regulations." The Chinese are also investing across the eastern Balkans, including in Serbia. Last year, Chinese President Xi Jinping arrived in the city of Smederevo in eastern Serbia to inaugurate the local steel mill, which had been bought by the Chinese steel giant, Hesteel. In an interview for the BBC, Ana Brnabić, the Prime Minister of Serbia, welcomed the Chinese investment, saying Serbia is already home to very many Chinese investments, including road and rail. She denied that this investment would give China undue political influence in the Balkans, adding "Without a doubt when you have a huge inflow of investment from one particular country, it always gives a bigger influence to that country. But I did not notice that it had any political influence." Serbia has applied to join the EU. Ms Brnabić added: "China wants to get closer to the EU and EU markets and Serbia is happy to be one of the central countries in the One Road One Belt Initiative because it's important for our GDP growth and that is our number one priority today. Politically it doesn't interfere in any way with our EU integration." Andrew Hosken's report on Chinese investment in south-eastern Europe will be on The World Tonight on BBC Radio 4 at 22:00 on Tuesday 17 October and will be available later via BBC iPlayer.